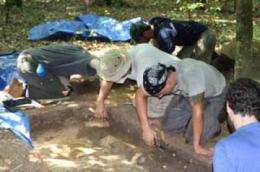 Students in the 2010 American University Dismal Swamp Field School excavating a probable 18th or 19th century maroon cabin footprint. Credit: Dan Sayers, American University. It's the year 1800. You're a slave in southeast Virginia. You manage to escape. Your freedom is only going to last as long as you can hide. Where do you go? Would you believe the Great Dismal Swamp? According to Dan Sayers, assistant professor of anthropology and an historical archaeologist at American University, that's exactly where you could have gone for immediate sanctuary. "There are interesting parallels. What was once more of a human refuge is now a natural refuge," said Sayers of the swamp, which officially became the Great Dismal Swamp National Wildlife Refuge in the 1970s. Since 2001, Sayers has been researching and exploring the presence of maroons (African-Americans who permanently escaped enslavement) and other communities in the swamp's approximately 200 square miles of undeveloped, densely wooded wetlands in southeast Virginia and northeast North Carolina. The current swamp is only 10 percent of the 2,000 square miles it was before the Civil War. To conduct his archaeology research in the swamp, Sayers had to secure a federal permit from the U.S. Fish and Wildlife Service, the government agency that owns the swamp. Aside from maroons, Sayers says the swamp was also home to Indigenous Americans (Native Americans), enslaved canal laborers (African-Americans who worked for the canal companiessome worked to buy or earn their freedom), free African-Americans, and outcast Europeans, such as criminals. Sayers' research project, called the Great Dismal Swamp Landscape Study, recently secured a $200,000 We the People Award from the National Endowment for the Humanities. It all began when Sayers decided to research the history of the Great Dismal Swamp from the 1600s through 1860 for his doctoral dissertation. From the beginning, Sayers discovered that he had his work cut out for himpractically no field research had been done in the Great Dismal Swamp Refuge. Historic documents only offered hints alluding to the communities. The dearth of information was so great that Sayers had to design his own landscape modelscarefully researched plans archeologists use to predict where a community might have been located, how big it might have been, and what elements would have been involved, depending on who lived there and when. "Say I was researching the history of a 1840s Virginia farmhouse," Sayers posed. " Based on historic documentation and previous field research of other, similar properties, I would likely be able to tell you where the house was on the land (if no longer standing), where the outhouse, barn, and possibly enslaved people's quarters would have been in relation to the house without even putting a shovel in the ground." To create his models, Sayers examined historic documentation and research about other, similar swamp communities in the Western Hemisphere, including those in Florida, Georgia, and Louisiana. "In other areas, local militias were often hired to capture maroons and destroy their settlements," Sayers said. "When they found these communities, they would document the location of settlements, the sizes, shapes, and number of houses and other structures before destroying them." The other swamps were nowhere near as dense or expansive as the Great Dismal Swamp, which is likely why so little documentation on the Dismal Swamp communities existed. Nobody who would have documented the Dismal Swamp communities had found them. It was truly a great hiding place. For the past three summers, Sayers has taken a group of American University students to sites in the swamp for a field school through which they gain valuable experience in the craft of archaeology, including photography, mapping, soil sampling, and excavation. This summer's field school begins May 17 and ends July 2. Sayers says the items unearthed during the past decade have been mundane, everyday itemssuch as part of a broken bowl, a gunflint, a stone tool, or bone fragments of a butchered animalbut they help tell the story of the people who lived there and how they interacted with each other and the outside world. The communities largely formed in three areas: the swamp's outskirts, the swamp's secluded interior (away from the canals), or along the canals. Each type of community existed for different reasons. People in the interior communities wished to be as isolated as possible and would have relied more on items they made by hand. Canal laborers, who lived in the communities along the canals, would have used more mass-produced items as they regularly interacted with the outside world. Interior communities also would have had more interest in monitoring who joined or left their ranks. "Leaders were very cautious about who came in and who left," Sayers said. "Their central concern was protecting the community's secrecy and security." Sayers says this summer's swamp field school site has the markings of a large community and that overall, possibly thousands of people lived in the swamp between the 1600s and 1860. "Many of these began as communities of Indigenous Americans around the 1600s," Sayers said. "When maroons started taking refuge in the swamp around the1700s, they began joining existing communities and also likely formed their own." According to Sayers, the artifacts indicate that the swamp communities began to dwindle around the 1860s close to the Civil War. "There were likely some minor skirmishes in the swamp as well as a gradual but strong exodus of maroons over the course of 3 to 4 years to join the fightobviously for the North,"
Sayers said about the war's impact. Swamp life wasn't easy for the people who sought refuge there and isn't easy for Sayers and his team. The swamp is called "dismal" for a reasonin the summer, the heat and humidity are oppressive. Stinging, biting insects, snakes, and bears are among the wildlife. Then there are the brambles with "thorns the size of shark's teeth" cited by Sayers as the reason he wears a full canvas suit in the field every day. But as dismal as swamp life is, the outcome is worth the effort. "These groups are very inspirational," Sayers said. "As details unfold, we are increasingly able to show how people have the ability, as individuals and communities, to take control of their lives, even under oppressive conditions."